Discussion in 'Other Ways To Make Money Online' started by clickhappier, Jan 17, 2016. Originally started as 'Midwest Internet'. Changed name to CrowdSource circa ~2011 (looks like the name was retroactively changed on all previous TO reviews at that time, unfortunately for historical purposes). Also owns the domains Write.com and Transcribe.com through which to recruit potential workers and customers. They now have their own 'workstation' platform on their own site for workers to use, at first alongside MTurk, now exclusively since July 2015. You get paid daily through a verified PayPal account. CrowdSource changed their name to OneSpace on Nov 17, 2015; URLs changed from crowdsource.com to onespace.com . Biiiig shakeups coming in the world of CS quals. They're going to start having permanently-available qual tests of some sort, which they're calling 'courses', instead of temporarily-available qual HITs; and they're simplifying down to a lot fewer different quals, combining many of them. If you already have at least one qual in the group of old quals that becomes combined into a new qual, they say you will be grandfathered into the new qual (exempt from needing to take the new tests), and have access to an increased amount of types of work at that level. They haven't yet said anything about how they will implement these new qual tests on the mturk side. A limited group of CS workers are testing things now. Being discussed at http://forum.crowdsource.com/discussion/2151/new-workstation-features and http://forum.crowdsource.com/discussion/2157/qualification-courses-feedback on the CS forum. The five I'd been posting about the testing for over the last several months (Media Moderation, Data Collecting, Data Categorization, Data Tagging [clothing], and Product Matching) are going to be turned into just two, Quality Assurance Specialist and Senior Quality Assurance Specialist. I don't think that table includes all the quals they still use, so there's probably some that are remaining as-is title-wise. They also said they will be revoking more old unused quals from people over the next few weeks, so don't be alarmed. 1. I already had an MTurk-linked account on their WorkStation (WS) website ( http://work.crowdsource.com ), which you can only get by being able to accept a CrowdSource HIT on MTurk and clicking a button that appears in the corner of it to generate an invite message sent to you through MTurk. Then clicking the link in that invite allows you to set up the login through Amazon (if you just go straight to WS and try to log in using Amazon without having an invite to activate, it will say 'you can't do that'). This may no longer be possible if you haven't already done it, as the dregs of CS's last available HITs on MTurk die off leading up to 7/22 paymageddon (there's already nothing still up from CS that I qualify for, if I didn't already have a WS account - check for yourself here), and I don't know if it would be possible for you to keep your quals/status with CS without that (otherwise you just create a WS account from scratch with Paypal only). 3. Go to http://support.crowdsource.com/ , click the Submit A Request link up top, use your WS-associated email address, and tell them you need to switch from MTurk to Paypal. Some time later (originally I'd heard it was taking like a week for them to respond to these requests, but then someone said it only took like four hours this past weekend, and today I got a response in less than an hour! ), you'll get an email reply. Alternatively, you can call CS toll-free at 855-276-9376. Apparently their office hours (for phone calls) are M-F 9am-6pm Central Time. 4. Then sign in on WS and you'll now be prompted to link a Paypal account. Click the link provided, sign into your Paypal account, and grant access to CS. 5. If your Paypal account isn't already in verified status with Paypal, you'll also need to jump through some hoops with them to get that done (similar to Amazon Payments), but mine has been for years. I think there was a CS forum post recently saying that all Paypal accounts must be verified by July 31, though I'm not sure whether newly-switching ones might be required to start off verified. PS: Though most people aren't qualified for most of their work, CrowdSource's HITs often made up 1/4 of all the HITs on MTurk. When you click on the 'Past Work' header link, it goes to https://work.crowdsource.com/history , which shows totals of everything you've ever done grouped by task title. If you click on one task type in that list, it shows you a list of each individual task you did in that type (unfortunately in that eterna-scroll 'load more' format I hate without the option to go directly to specific page numbers), and you can click on one of those tasks see exactly what you submitted on it. When on that ^ list page, if you remove click the x to remove the filter criteria for that task type, or go straight to the hidden url https://work.crowdsource.com/submissions , then you see a list of each individual task you did of *every* type. Unfortunately you don't see what type they were that way. When on the main 'Past Work' page https://work.crowdsource.com/history , there is a feature in the left-hand column to let you apply 'before' and 'after' date range filters. This adds stuff to the URL query string that looks like this, for example: ?after=2015-06-28&before=2015-07-29 . It can be used with just 'before' ( ?before=2015-07-29 ), just 'after' ( ?after=2015-06-28 ), or both together like that. When on the Submissions page, there isn't an interface given for the date filters, but someone pointed out on the CS forum today that you can still add values like that to the query string manually, for example https://work.crowdsource.com/submissions?after=2015-06-28&before=2015-07-29 , and it will work (in the same buggy way it ever works, described below). The dates specified in the query string currently will result in filter settings displayed on the page that are 1 day earlier from what you thought you were asking for. So the above example URL turns into "After Jun 27, 2015 X" and "Before Jul 28, 2015 X". And it seems to be even buggier than that - the effect it actually has on the results isn't what it should be, based on either the query string values or the day-earlier displayed filter settings, and regardless of whether interpreting the stated dates inclusively or exclusively. So it is currently impossible to narrow down to a single day's totals or tasks. For example, I know I did tasks from group A on 7/22 around 9pm, and tasks from group B on 7/23 around 5am (as recorded by the timestamps CrowdSource displays for them), and none of either before or since then so far. I used this to try testing all combinations of dates around them. If it weren't buggy as hell, at least one of these combinations should've resulted in seeing only A and not B, or only B and not A. ?after=2015-07-21&before=2015-07-24 includes both A and B. ?after=2015-07-22&before=2015-07-24 includes both A and B. ?after=2015-07-23&before=2015-07-24 includes both A and B. ?after=2015-07-21 includes both A and B. ?after=2015-07-22 includes both A and B. ?after=2015-07-23 includes both A and B. ?before=2015-07-24 includes both A and B. 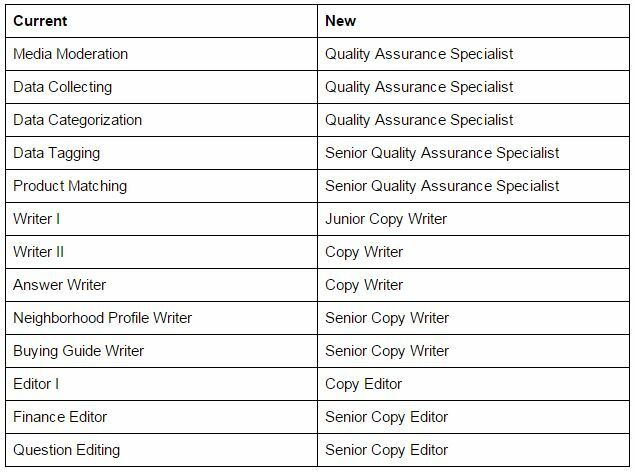 Some more info I originally put together in July 2015 about how the writing work gets edited; their system has changed a bit since then, with writing that fails editing getting a chance at being reworked for a half-credit towards maintaining one's writer level.
" https://work.crowdsource.com/profile/index This link goes to your main CS profile. It has the statistics for every type of task you do. You can see if you have any rejections because it will show up in your approvals and approval rate. If your approval rate is not 100%, then something was rejected at some point. https://work.crowdsource.com/career/writing/digest/ This link goes to your tracker for the 100- and 200-word answers. It only shows the status of your last 30 submitted Q&A tasks. If you scroll down, you can see which tasks failed (if any) and get the attached feedback. Also, ignore the 'Pending: 0' in the chart because it says 0 for everyone. You receive passes or fails based on the number of radio buttons clicked on the Edit checklist. You receive rejections if your answer falls into any category on the Flag checklist. Pass: Editor marks two or fewer radio buttons on the Edit checklist. You get paid and your tracker rating (second link) stays the same. Fail: Editor marks three or more radio buttons on Edit checklist. You get paid, but your tracker rating drops. If your rating drops, you end up getting paid less for the same work. Drop too much and you lose access to the tasks. Rejection: Editor marked one or more radio buttons on the Flag checklist and a CS admin approved the flag (all flags need admin approval). Your work was rejected, you were not paid, your tracker rating drops, and your approvals (first link) are affected.
" Fail: Affects rating percentage; gets paid. Rejection: Affects rating percentage; may not get paid. We see anonymous blocks of text. There's no names, dates, identification, anything attached to the answer. We have no way of knowing if the answer is the writer's first-ever submission or if the person has been submitting tasks for years. However, every writer is expected to follow all of the rules, so every answer is held to the same standards. If an editor marks even one item on the flag checklist, it's grounds for a rejection. This means the editor doesn't have to make any corrections to the answer because it's not usable. A bad source is one of the quickest ways to get a flag on the Q&A tasks, though failing to follow the question type guidelines is also up there. There is no way to revise your article after submission unless an editor/admin sends the work back to you for revision. Because of this, it's really, really important to read all of the instructions before submitting work. IMO memorizing the task-specific instructions is more important than learning the style guide. Style-guide errors may get you a few dings and fails, but messing up the task-specific instructions often leads to a rejection. When you first start out, you are given a grace period when you're still paid for rejected tasks, so you have some room to improve without losing access to the writing tasks.
" The three-ding fail system is definitely broken, but it's on CS to fix that. Since the editing qualification tests are up constantly now, there are always new editors coming into the queues and they may not know that three dings equals a fail. Besides that, the editing instructions specifically say to mark the radio button for each type of error present in the answer, and CS has said that editors can lose their quals if they fail to mark for the errors.
" A CS admin is the only one who can reject work. An editor can't reject something outright. Instead, the editor flags and a CS admin reviews the flag.
" Editors have a checklist consisting of 12 radio buttons to check off on every task. These range from subject-verb agreement errors and use of the inverted pyramid structure to punctuation and capitalization errors. The final radio button is for CrowdSource style guide errors, which is a catch-all for everything else. If the editor checks three of those buttons (or, as people say here on the forum, "dings" you three times), your article receives a fail. 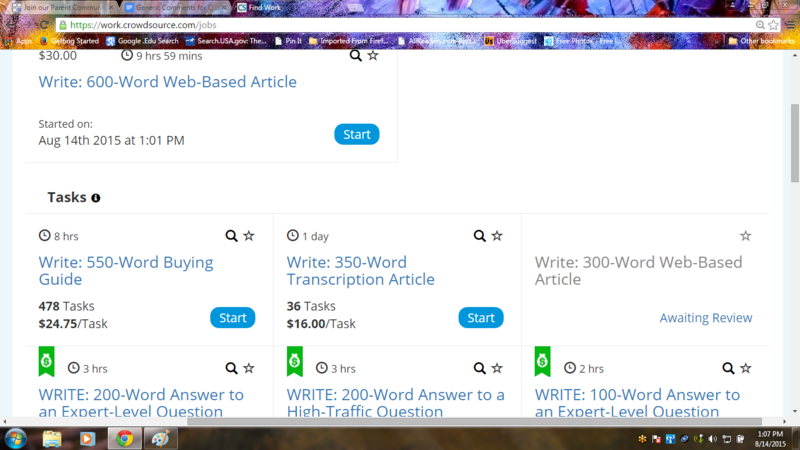 You still get paid for it, but it affects your writing level *for the Q&A tasks only* -- If you receive three or more fails within 30 tasks, you drop down a level and your pay rate is decreased. If you receive three or more fails within 30 tasks while you're at Level I, you're off the project. The editors also have a 7-point checklist for flagging an article. Articles are flagged for things like failing to answer the question, providing inaccurate information, inserting personal opinion, plagiarism, and, especially, using unapproved resources. Sadly, many well-written articles get flagged for violating resource rules. Editors can also flag for "multiple instruction violations and/or poor quality writing" -- this encompasses anything from 400-word articles to articles that contain so much fluff and filler that they can't meet the required word count after editing to articles written by people who haven't mastered the fundamental rules of the English language. CrowdSource has a modest amount of audio/video transcription work, which requires a qual test (and there are complaints that the current version of the transcription test is too writing-oriented, doesn't focus on transcription). It will be a replacement for the 'beginner limits' that cut people off after a small number of HITs on a certain task type until you've had x amount of that type approved (which should appropriately be called caps/limits, but which some CS forum users have an unfortunate water-muddying habit of calling "soft blocks"). "Task Training allows freelancers to experience new tasks gradually and with increased feedback from trusted reviewers. When you are in Task Training mode, you will receive feedback on each task you submit. Once you hit the passing threshold (project specific), you will graduate and have access to the full project. 1) When Task Training is enabled and as a trainee, you have reached your limit of tasks that you can do before getting feedback. 2) If a limit is in place for Beginners a project or projects and you are a "Beginner" in that project and have reached the limit of tasks you can do without receiving feedback. We do not currently have any projects that are using Task Training at the moment (we will start activating it on several projects this week). Consequently, what you are seeing is the result of some of our existing projects that are set up with Beginner limits. Our goal over the next several weeks is to migrate projects that are currently using our legacy concept of "Beginner Limits" to the improved experience of Task Training. I don't know what this number consists of - all workers ever registered on CrowdSource/OneSpace, workers with a verified Paypal account linked up, workers who did at least x tasks within x time, workers with x qual, etc - but CS_Elise mentioned on 8/13/15 that "the entire workforce" is "about 3500 people" at that time. I think Ask.com is who the majority of q&a tasks are for. Thredup.com previously was 'Tag: Images of Clothing' and 'Review: Images of Clothing'. Lowes had the color swatch HITs I enjoyed for their brief appearance in 2014, and a couple other types I don't recall. Office Depot was/is matching product numbers from the OfficeMax merger (Staples acquiring Office Depot still isn't a done deal / sure thing yet). Invisible Boyfriend/Girlfriend is who 'Write: Text Messages in 160-characters or Less' is for. Hayneedle.com previously had product descriptions. GreaterGood has 'Viral Video Topic Briefs' (new in Aug 2015, in the 'Research' category but requiring 'Junior Copy Writer' qual from what I can see). Since August 2015, when you initially sign up on the OneSpace site, you won't see any work available to you until you pass at least one of their qual tests (misleadingly labeled 'courses' in the interface). Even the SEO tasks (misleadingly labeled 'surveys') that used to be open to everyone are now mostly restricted to those who've passed the QA Specialist test. (And even once you do pass one or more of the tests, a lot of the work is increasingly further restricted to those who've managed to do a certain amount of it before it went closed-invisible-qual.) Unlike on MTurk, with the exception of a few task types they might be currently 'promoting', you can't see most of the work you don't currently qualify for.
" We are celebrating here at CrowdSource and we have our stellar workforce to thank for it. This week, we crossed the threshold of 100 MILLION tasks completed in WorkStation! Our freelancers have been busier than ever, writing, editing, categorizing, moderating and transcribing their hearts out, and this milestone is a testament to all of their hard work. What Is it Like to Work at CrowdSource? It’s an interesting story, actually. While operating an online publishing business [Midwest Internet], our founders developed a need for creating engaging, scalable web content. Rather than hiring 150+ team members, our founders decided to look to outsourcing. They used some of the common freelancer platforms on the market, but quickly found managing freelancers at scale was a full-time job in itself. So, they decided to create software to do it for them. As the platform evolved, it became evident this software could be extremely useful to other businesses. That’s when CrowdSource was spun off as its own business entity. Our leadership team values creativity, collaboration and outside-the-box thinking. Walk through our office and you’ll notice these themes integrated throughout. From the open floor plan to the fully stocked lounge, our “work hard, play hard” attitude inspires open ideation. Everything about our space has been carefully designed with our team members in mind. Much like our approach to software development, usability is our first priority. There are a lot. Our team enjoys an on-site gym and free workout sessions with a personal trainer twice per week, free haircuts, oil changes, and a casual dress code. Lunch is catered every Friday, and on top of that, we take “TGIF” to a new level by closing our office at 2:30 every other Friday. Why? Because we empower our team to focus on accomplishing goals, not working crazy hours. In addition to the thousands of freelancers who complete work on our platform remotely, CrowdSource is comprised of roughly 50 in-house team members whose duties range from software development to sales to project management. A Content Project Coordinator works closely with an Account Manager to make sure CrowdSource has a solid understanding of a project’s final objective and identifies a clear, step-by-step process to meet that objective. In today’s world of online publishing and search engine optimization, only one thing’s for certain: quality content is king. And if there’s one thing CrowdSource prides itself on, it’s creating high-quality content. A Content Project Coordinator is the person who’s responsible for ensuring our freelancers are creating the best content possible. This involves setting up projects in WorkStation, the online portal where our freelancers log in to complete their work, and training freelancers via instructions and webinars. It also requires regular review of freelancers’ work, as well as providing helpful, constructive written feedback. A crucial aspect of being a Content Project Coordinator is ensuring that we meet these production goals while maintaining quality. If a project is at risk of missing a goal, it is the Project Coordinator’s duty to get creative and come up with ways to make sure we hit it (like a special competition or bonus program for freelancers). What Does a Data Project Coordinator Do?
" Some people see the world through jigsaw-shaped lenses. They are quick to identify the pieces of a puzzle, and get a kick out of analyzing those parts to find the most efficient – and accurate – solution. That’s us. At our core, we are problem solvers. On a larger scale, we use big data to solve complex problems for some of the world’s biggest companies. Sound awesome? It is. Welcome to the Operations Team. The coolest part about the work we do is that we are hands-on through every step of the project, from start to finish. Our Data Project Coordinators work directly with key stakeholders to develop a strategic plan for meeting client objectives. (Cue: jigsaw spectacles). They are then responsible for project implementation, execution and evaluation. As a Data Project Coordinator, you own your projects, and will (and should!) take pride in what you have accomplished. Every day is different at CrowdSource; if you walked in tomorrow, you might find us talking through a way to streamline the project instructions for our freelancers, or brainstorming with our Account Managers on a client’s priority shift. ... We keep a quick pace around here. The daily ebb and flow (emphasis on the flow, not a whole lot of ebb) requires us to remain flexible but focused.
" We’re excited to announce that on Nov. 17, 2015, CrowdSource will unveil our new identity: OneSpace. As we expand to provide a more robust set of solutions to both clients and freelancers, we feel it’s important for our brand to reflect our commitment to providing a single, simple-to-use platform where businesses and freelancers can collaborate. •WorkStation will now be called OneSpace, and you’ll access it from work.onespace.com. •Once you log in, you’ll see our new logo, as well as our updated color scheme, featured throughout the platform. •A system outage will occur on Nov. 17 to facilitate the transition from the old platform to the new one. The outage will begin at 11 a.m. CST and last for approximately one hour. More changes are on the horizon. Look for announcements in 2016 heralding exciting improvements to OneSpace and the opportunities available to you as the biggest brands on the Internet launch their work on OneSpace. Edit: This 'OneSpace' name is the very-belatedly-decided winner of the $5000-prize domain name contest from back in January 2015, 10 months ago.
" Hey everyone - quick update for you regarding the public profiles. As OneSpace, we will begin expanding the types of work that we offer through our platform. Some of this work lends itself to a more direct, one on one relationship with clients. In those instances, clients will want to know who they are working with to ensure they are hiring the right person for the work. With that being said, we will continue to increase the type of work we offer today as well. I can assure you that before we were to move forward with a "public profile" we will provide you with advanced notice and give you options for visibility. We absolutely understand several of the concerns you have brought up and have also considered that many of you enjoy the anononymity our platform provides. Tomorrow's update will not make any of your information public. As we expand our platform, we will be sure to keep you informed along the way. " 1. While the colors and logo might be different, no other major changes to how you access work will be taking place. 2. This rebrand does not impact the work we currently have flowing through our system, nor any future work from our existing clients. It does however, increase the likelihood that more work will be available on our platform. 3. The qualification process for all you OneSpacers is not changing from how it works currently. Your existing qualifications and proficiency levels will remain intact. 4. Your profile information will not be made public. In the future, we will be surfacing an option to make profiles public, but you will have advanced notice and will have options for adjusting your visibility options for what is made public. This includes what name is made public...or if a name is public at all. " " We've reached the end of 2015 and are putting the finishing touches on our 2016 plans. There are a lot of new and exciting things coming your way in 2016, but before we hit the ground running in the New Year, here is a quick look into everything OneSpace accomplished with your help in 2015. Thank you for all of your contributions over the last year, and here's to an even more successful 2016! OneSpace freelancers completed over 28 million tasks in 2015. That means that a task was submitted every ~1.2 seconds! The 58,978 freelancers that completed tasks for OneSpace in 2015 would fill Chicago's Soldier Field. If the work performed by OneSpace freelancers in 2015 had been assigned to internal resources, it would have required 984 full-time employees to deliver the same results. The cumulative time OneSpace freelancers devoted to client projects in 2015 adds up to 885 years of production. " If so, that's an average of 34.7 hours per worker over the year, and 0.73 hours (4.35 minutes) per task. PS: And of course they did this over a week too soon; although most of the OneSpace employees are apparently on vacation Dec 24-Jan 4, some tasks have continued to be posted and submitted during that time, so the year wasn't quite over yet. Big uproar on the OS forum today, Jan 11, 2016 - the high-volume 100/200-word Q&A writing project for Ask.com is coming to an end this month. Starting this evening, the remaining work in it is restricted to those who've earned a high enough level from their previous work on it, and they're estimating it will run out entirely in about 2 weeks. This likely also means the closed-workforce lead-in projects "Classify: A Question" and the ones to write and edit the questions (before writing and editing the answers) are gone too. The 'Copy Writer' test was made available again on Jan 26. OS is going to be significantly revamping their work site some time next month (March 2016). Our handful of interface-improving scripts will all either become obsolete (no longer needed) or have to be extensively updated when that happens. They apparently picked some favorite workers to 'beta test' the new design, but I'm not one of 'em. See the OneSpace forum thread for what little is known so far, which may change.